National Oyster Day and the desert may not seem like they’d naturally go together… but they do at Buck & Rider! Celebrate Buck & Rider’s first National Oyster Day on Friday, August 5, 2016 with an all-day Oyster Happy Hour from 11 am to close in Abby’s Oyster Bar, the dining room and patio. 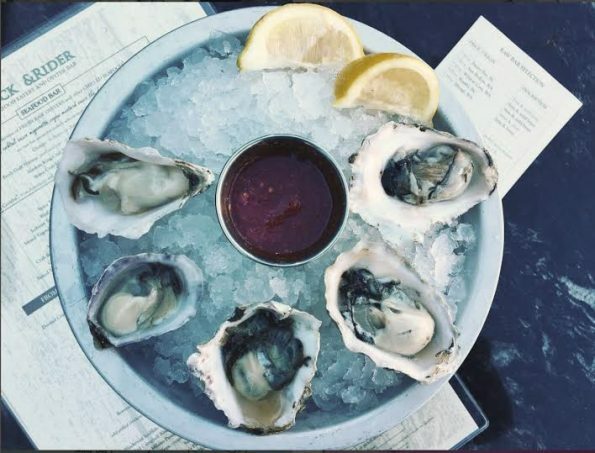 Half off our daily selection of raw oysters flown in from the East and West coasts daily and served with your choice of cocktail sauce, mignonette, cognac mustard sauce, Thai dipping sauce or horseradish. Buck & Rider is committed to serving only the most carefully selected seafood. They tailor and curate their selections according to the seasons in order to capitalize on the best the market has to offer and pass that quality along to you. They serve only the freshest and most sustainable seafood available at the best price the market has to offer. They guarantee by going the extra mile, you will enjoy a bounty of seafood that cannot be found anywhere else in the Southwest. Buck & Rider, a seafood eatery, and Abby’s Oyster Bar focus on a fun vibe, young attitude and clean line up of food and drink. The menu features fresh, never frozen seafood, farm fresh salads, Jidori chicken, certified angus beef and classic desserts from LGO Bake Shop.